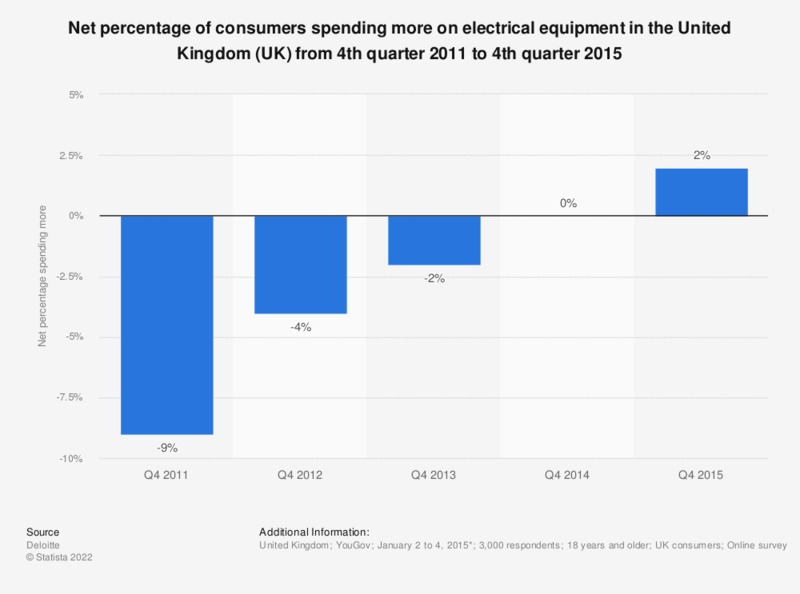 This statistic shows the share of UK consumers spending more on electrical equipment in the United Kingdom from 4th quarter 2011 to 4th quarter 2015. According to Deloitte's consumer tracker, consumer spending on electrical equipment over the past three months of each quarter had decreased. In quarter 4 of 2014, the net percentage of those spending more was even at zero change. Figures given as a net percentage of consumers spending more over past three months (as of each quarter). The source adds: "The net balance is calculated by subtracting the number that reported they spent less from the number that reported they spent more." * Q4 2015 survey. Previous survey dates not given.